In the last few years, we’ve seen a shift in wedding season popularity. For generations, summer has been chosen by brides because of the reliable weather and relaxed atmosphere. Today, however, according to a survey done by The Knot, October is now the most popular month for weddings. 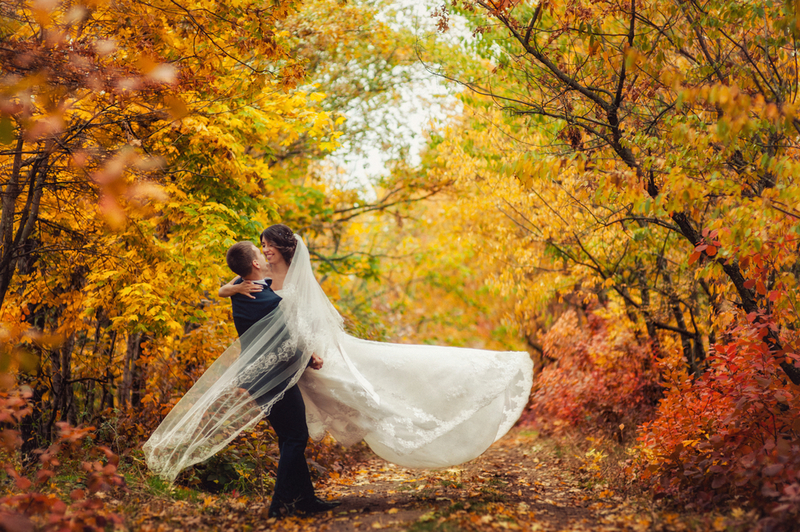 If you’re considering an autumn wedding, or maybe still undecided, we have a few ideas that will inspire you. Use plum and berry colored leaves and a gold or bronze tray. Paint the guests’ names on the leaves and place them on the tray as a seating card arrangement. Incorporate leaves and feathers and twigs into your bouquet for a rustic, autumn theme. Scatter various colored leaves down the center of the table between centerpieces. Add leaves and twigs to the centerpieces to add interest and texture. We associate the harvest season with wheat and pumpkins, so why not include some of these in your decor. Use pumpkins, squash, sunflowers to create a cozy centerpiece. Add a few sprigs of greenery and candles for added texture. Make sign holders or place card holders out of mini pumpkins. For a touch of rustic chic, create a wheat centerpiece. Bunch the wheat together and tie it at the center with jute so that it will stand. Accent with fall-colored candles. Spray mini pumpkins with white paint and wrap berry twigs around them. To bring in the jewel tones of autumn, use colored glass. For example, use topaz vases and emerald or ruby goblets. Use red roses and black accents in the centerpieces and the bridal bouquet. For a more playful look, use black and purple. You could use black candlesticks with purple candles, for instance. It’s a little far-fetched, but you and the groom could dress in grey and black. Let the bridesmaids and flower girl wear black sequin dresses. Spray leaves with black paint, string them together and hang them from the ceiling as a simple backdrop. Invite guests to trick-or-treat at a Halloween candy bar. Or, have an all-black dessert bar. Most of us associate fall with the first day of school. It was a magical time for new friends, new teachers, new things to learn. So, a back-to-school theme can be nostalgic as well as charming. Use old school books, flowers, and a small chalkboard as centerpieces. Add a votive candle and a few sprigs and twigs for added interest. Apples make an interesting place card. Paint the guest’s name on the apple or affix a name card to the stem. For a whimsical touch, spray small plastic windmills with silver paint and place them in clear vases. Buy some pencils, crayons, chalk, and erasers and strew them on the tables. Use elementary school tablets with the ruled lines to make signs. Print the signs to mimic a school-aged child’s handwriting. Use small, colorful throws on the chairs or benches for a cozy look. Make place cards out of miniature tree slices. Paint or engrave the name and add a few sprigs of greenery. Guests can take them home as a keepsake. Decorate twig baskets with artificial moss and leaves and use as centerpieces. Use miniature white light strings to decorate trees or shrubs for a little added enchantment. These are only a few of the thousands of ideas for a fall wedding. You’re sure to have some creative and beautiful ideas of your own to add to them. Now that you’ve decided to have a fall wedding, you need to choose the right venue that will complement the theme. Take a few minutes to explore our website and you’ll see why The Cabin at Old Spur is the perfect choice. Our conveniently located and affordable venue nestled in a woodland setting is ideal for an indoor or outdoor occasion for every season of the year. Call today to find out more about our unique setting. We look forward to being a part of your special day.